Ride on the back of a dinosaur wielding heavy weaponry and fight to be the last one standing in the craziest battle royale game designed specifically for mobile! 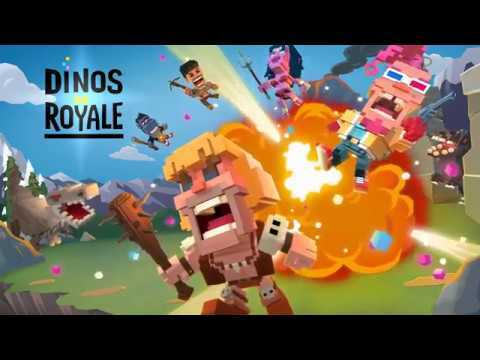 ** BATTLE ROYALE for MOBILE **Dinos Royale is a PvP battle royale game viewed from a top down perspective played in short 3-5 minute matches making it perfect for mobile play on the go! Dinos Royale features easy to pickup dual stick controls with a simple on screen inventory system for comparing and equipping all of your gear. ** FIND WEAPONS AND ARMOR **Guns! Armor! Guns! Medpack! Search the map for the best loot and equip crazy weapons ranging from a spiked baseball bat to throwing knives to a grenade launcher! Take less damage by outfitting your character in helmets and other armor pieces. Heal up with a med-pack when health is low. ** RIDE DINOSAURS **Jump on the back of a triceratops and ram the competition. Or get around the map quickly and attack with speed using the velociraptor. Or devour your puny foes as the king dino, the T-Rex! Shooting isn’t always the answer – sometimes you gotta use your teeth! ** EPIC BATTLE MAP **Don’t let the storm catch up with you! Duck in and out of buildings, hide in the caves or take cover under the canopies. Dinos Royale’s huge map and varied terrain make for tons of variety and tactical opportunities. ** INTENSE GAMEPLAY **Play against real people from all over the world online or practice up and improve your skills against bots in offline mode. Battle alongside a friend in DUOS or go it alone in SOLOS. You decide how you want to battle but you must remember one thing – outlast them all!